The large double ball race construction and heavy duty gauge steel provide in the 40-A-MH the rugged running gear for heavy duty manual and medium duty power drawn operations. Available wheel selection meets most industrial or commercial floor requirements. Swivel Bearing: Hardened and polished steel balls in coined and hardened upper raceways assure easy swivel action and long service life. Swivel design provides maximum protection for the king bolt. Fork: Wide, deep formed legs are continuously welded to the cup for maximum strength and rigidity. King Bolt: Heavy duty steel bolt with crown nut and cotter pin. Axle: Threaded axle bolt with square head that fits against lug on fork preventing it from turning. Axle is secured with crown nut and cotter pin. Wheels: A full selection of industrial type wheels in either 2-1/2” or 3” face width is available. Wheel Bearings: All wheels are available with either straight or tapered roller bearings. Straight roller bearings consist of a split outer raceway with high quality hardened steel rollers held parallel to the axle by a steel retainer. A hardened and ground sleeve provides a precision inner raceway. Two precision tapered roller bearings per wheel mount directly on the axle. Lubrication: Readily accessible pressure fittings to swivel assembly and to either wheel hub or axle. RIGID CASTER: The 41-A-MH is made of heavy steel sections, deep formed and welded to match the strength and rigidity of the matching 40-A-MH. Bolt hole spacing and overall height are the same. Wheel Diameter 5" by face width of 2-1/2"
Wheel Diameter 6" by face width of 2-1/2"
8" X 2-1/2" Wheel diameter 8" by face width of 2-1/2"
10" X 2-1/2" Wheel Diameter is 10" by face width of 2-1/2"
The load capacity is rated for manual operation. 8" X 3" Wheel diameter 8" by face width of 3"
10" X 3" Wheel diameter 10 " by face width of 3"
The "Mity-Mite" is designed specifically for very heavy in-plant service and features high capacity, low height and long life. Construction: Heavy gauge steel plate, machined and welded to provide the rugged construction needed for heavy factory service where uneven floors, metal chips, etc. might be encountered. Swivel: Precision bearing units are provided for both load bearing and thrust. Bearing units are replaceable. King bolt: High strength steel bolt with slotted nut and cotter pin. Lubrication: Pressure fitting in yoke base serves complete swivel. Wheel is lubricated through hub. 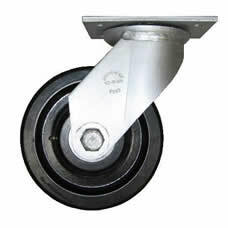 Mity-Mite casters can also be fitted with other wheel materials with similar weight capacity.